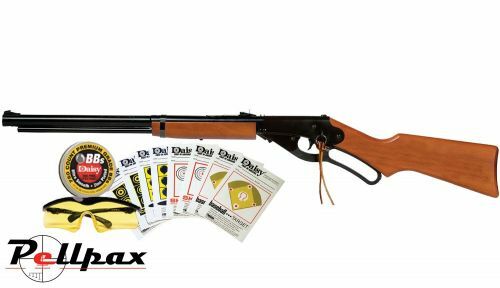 The Red Ryder emulates trhe guns of the old west with its aesthetic design and lever action. The new Fun Kit from Daisy offers everything you need to get shooting, straight out of the box. Ideal for target shooting, the Fun Kit comes complete with a variety of targets that are designed to test your shooting abilities. The rifle also comes with safety glasses and 750 premium grade steel BBs. The rifle is spring powered with an under lever action meaning no gas canisters required, simply pick it up and start shooting! The stock is made from real wood and richly stained for a great finish. The rifle is made to very high standard considering the price and makes an ideal gift for younger shooters. Also Available as an Individual Rifle. - Barrel Length : 10.85"
- Overall Length : 35.4"